Snake science on Twitter: David Steen identifies photos as copperheads and cottonmouths or not. This one actually is a cottonmouth. Still, don’t kill it. Social media has been billed as a way to start conversations with anyone, but most people only speak with people just like themselves. It’s great for connecting those who like or think the same things, but not so good for exposing people to new perspectives. Especially new perspectives about things people misunderstand, fear, or hate. David A. Steen, a wildlife ecologist, research fellow at the Alabama Natural Heritage Program at Auburn University, and occasional Slate contributor, is biology’s best social media ambassador. Steen’s Twitter presence—his handle is @AlongsideWild—is geared almost entirely toward breaking out of the social media echo chamber and politely confronting those in need of some outside information. Snake information. Steen says he has always been interested in communicating with people curious about something they saw or heard in the wild even if they’re not necessarily interested in wildlife ecology and conservation. For years, Steen’s herpetological outreach was based on his blog, but the problem is that people have to actively surf or Google their way to it. (He also runs a great Facebook account, Living Alongside Wildlife.) With Twitter, he didn’t have to wait to be found. Judging from social media, a person does one of two things upon sighting a snake. No. 1: Take a quick photo before fleeing in terror and posting the picture on social media, or No. 2: Murder the snake with a shovel or foot, take a picture, and then post it on social media. By rule, in the case of a nonmurdered snake, the social media poster will ask the anonymous online masses what kind of snake it is. 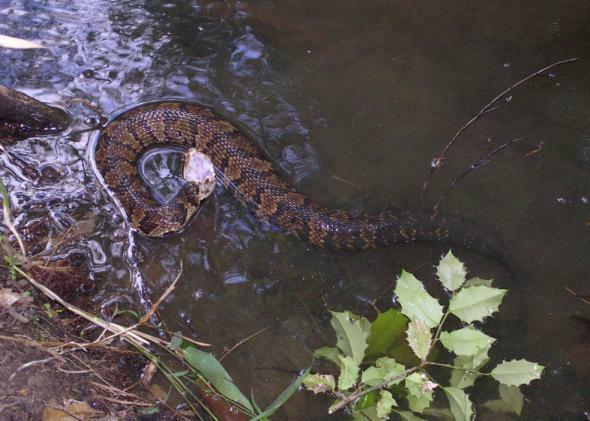 And by rule, some commenter will respond that it’s either a deadly cottonmouth or a copperhead. In the case of a murdered snake, the brave vanquisher will volunteer the cottonmouth or copperhead identification himself. Of course, these snakes are almost never actually cottonmouths or copperheads, and David Steen is there to correct the record. There are more than 150 species of snakes in the United States, and the vast majority of them are completely harmless to humans. But just as every single shark is a great white, our nature-deprived populace views every slithering reptile as dead. Steen takes upon his back the Atlas-ian burden of our nation’s snake misidentification crisis, tirelessly responding to strangers posting snake pictures on Twitter. He tells me he has set up alerts that ping keywords when people post about snakes, then he spends about an hour per night looking at the photos and scheduling responding tweets to be released throughout the day. The toughest part is getting the keywords right: He says many of the people tweeting about “copperheads” are actually tweeting lyrics to “Copperhead Road” by Steve Earle. Steen has corrected thousands of snake questions or misidentifications on Twitter. His signature #NotACopperhead and #NotACottonmouth hashtags each bring up hundreds of responses to individual social media posts. And with such politeness! There’s no #snakeshaming here, rather a “beautiful!” compliment for a photo of a live snake, and a subtle “try asking me first next time” attending every photo from someone who killed the snake first. With every identification corrected and tweet retweeted, another citizen is exposed to the world of reptile science and disabused of reptile myths. He’s a modern-day St. Patrick, banishing snake misidentification from the land! The posters are, for the most part, delighted and relieved to have a snake expert appear and answer their questions. Being followed on Twitter by those he corrects is a win for wildlife, because now these folks are exposed to information—correct information—about snakes. This being social media, of course, some people are not so delighted. Some people are embarrassed that they killed something harmless instead of something dangerous, others are just certain that their ID is the correct one. Whatever the reason, he’s been called every bad name on Urban Dictionary. Thank goodness Twitter has a block function. It’s tireless work on the front lines of the fight between nature and civilization. I don’t know of a more effective use of social media’s reach. Godspeed, David Steen; every squished garter snake is just another chance to spread the good word.